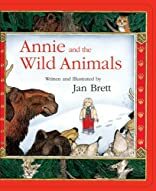 Annie And The Wild Animals was written by Jan Brett. Annie And The Wild Animals was published by Houghton Mifflin Company. 5/7/2009 Loni Edwards said: These have to be some of the most beautiful illustrations!